Appearance: Nightfall is a slender, broad shouldered, black and white shecat with ice blue eyes. The tips of her ears, two dots above her eyes, and her tail tip are white. She has large paws, long claws, and long legs. Later on she obtained multiple scars while fighting against opposing clans. Mutation: Longer, narrow claws and a long tail. Personality: Nightfall is the type of shecat who speaks her mind without a second thought. She's brutally honest with a sassy and sarcastic demeanor. Highly stubborn, she's not one to be teased about her scars and faults. Instead she's more likely to claw out the eyes of the cat who dared to tease her. Nightfall has a temper that's easily set off, and she has a deep hatred for all enemies of her clan. She's a natural leader with a passion for helping her littermates and serving her clan to the best of her ability. History: Nightfall was born to Bumblelily and Crowflight, two CrestClan warriors. Alongside her were Adderkit and Blackkit, two toms. They grew up relatively easily, but being slightly smaller, Nightfall was teased at times. Luckily, her mentor, Bramblepath, warded off most of the bullies while teaching her how to properly defend herself. When she obtained her scars, she viciously spat back insults to whomever teased her about them. It continued while she was an apprentice, but she matured slowly over the moons, earning Nightfall as her warrior name at fourteen moons. 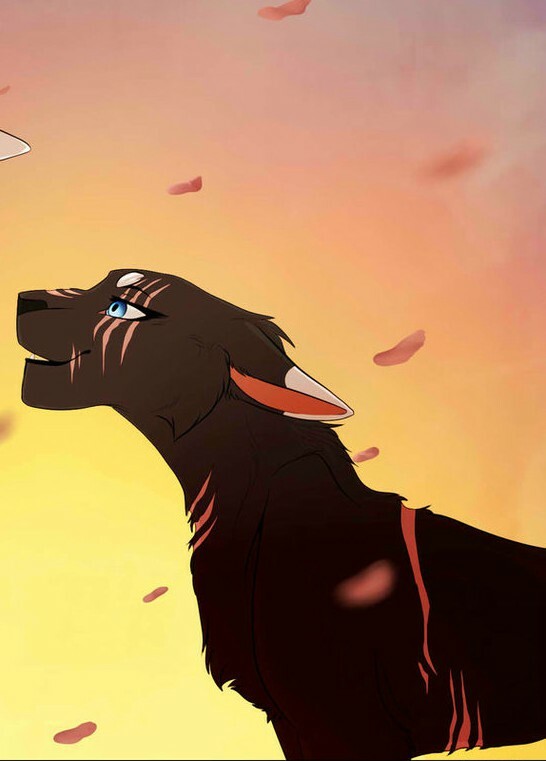 Since then she's been a loyal warrior to CrestClan.